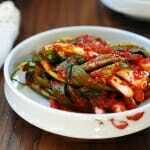 An easy kimchi made with thin green onions (also called scallions)! 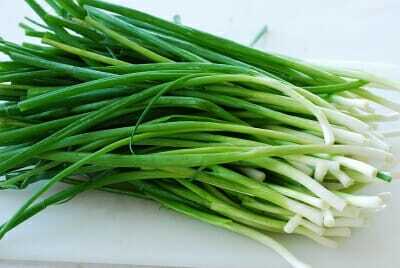 Clean the green onions by removing the root part and any tough/brown outer skins. Wash them thoroughly a couple of times. Shake off excess water, and drain well. Mix all the seasoning ingredients in a bowl. 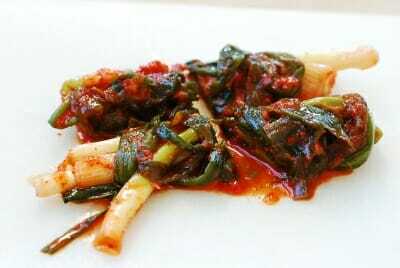 Cut the dried squid into about 2-inch long thin strips. Soak in water until slightly softened if very dry and hard, but this is generally not necessary. 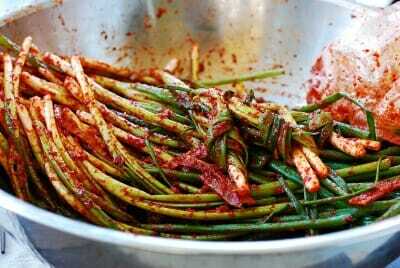 In a large bowl, gently rub the seasoning mixture all over the green onions and the optional squid to evenly coat them. Hold a couple of green onions together, and fold them before arranging in an airtight container to store. Another option is to tie them together by wrapping the other end of the green onion around the white part, making a circle in the middle, and then running the leafy part through the circle. Keep it at room temperature for a day, and then refrigerate. 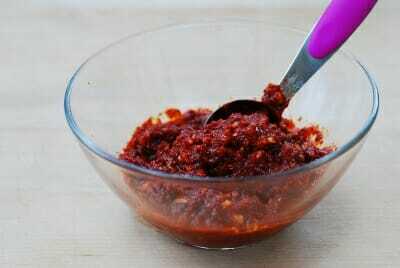 Pa kimchi can be eaten right away, but the flavor develops as it ferments over 2 to 3 weeks in the fridge. Run a knife (or a pair of kitchen scissors) through the folded or tied green onions a couple of times to serve.